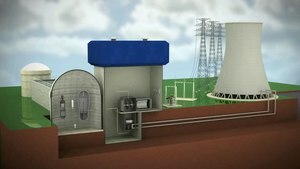 Pressurized water reactors (PWRs) constitute the large majority of the world's nuclear power plants (notable exceptions being Japan and Canada) and are one of three types of light water reactor (LWR), the other types being boiling water reactors (BWRs) and supercritical water reactors (SCWRs). In a PWR, the primary coolant (water) is pumped under high pressure to the reactor core where it is heated by the energy released by the fission of atoms. The heated water then flows to a steam generator where it transfers its thermal energy to a secondary system where steam is generated and flows to turbines which, in turn, spin an electric generator. In contrast to a boiling water reactor, pressure in the primary coolant loop prevents the water from boiling within the reactor. All LWRs use ordinary water as both coolant and neutron moderator. PWRs were originally designed to serve as nuclear marine propulsion for nuclear submarines and were used in the original design of the second commercial power plant at Shippingport Atomic Power Station. PWRs currently operating in the United States are considered Generation II reactors. Russia's VVER reactors are similar to U.S. PWRs. France operates many PWRs to generate the bulk of its electricity. Several hundred PWRs are used for marine propulsion in aircraft carriers, nuclear submarines and ice breakers. In the US, they were originally designed at the Oak Ridge National Laboratory for use as a nuclear submarine power plant with a fully operational submarine power plant located at the Idaho National Engineering Lab. Follow-on work was conducted by Westinghouse Bettis Atomic Power Laboratory. 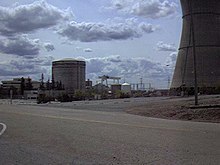 The first purely commercial nuclear power plant at Shippingport Atomic Power Station was originally designed as a pressurized water reactor (although the first power plant connected to the grid was at Obninsk, USSR), on insistence from Admiral Hyman G. Rickover that a viable commercial plant would include none of the "crazy thermodynamic cycles that everyone else wants to build." The United States Army Nuclear Power Program operated pressurized water reactors from 1954 to 1974. Three Mile Island Nuclear Generating Station initially operated two pressurized water reactor plants, TMI-1 and TMI-2. 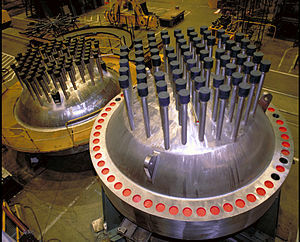 The partial meltdown of TMI-2 in 1979 essentially ended the growth in new construction of nuclear power plants in the United States for two decades. The pressurized water reactor has three new Generation III reactor evolutionary designs: the AP-1000, VVER-1200, ACPR1000+, APR1400. Pictorial explanation of power transfer in a pressurized water reactor. Primary coolant is in orange and the secondary coolant (steam and later feedwater) is in blue. Nuclear fuel in the reactor pressure vessel is engaged in a fission chain reaction, which produces heat, heating the water in the primary coolant loop by thermal conduction through the fuel cladding. The hot primary coolant is pumped into a heat exchanger called the steam generator, where it flows through hundreds or thousands of small tubes. Heat is transferred through the walls of these tubes to the lower pressure secondary coolant located on the sheet side of the exchanger where the coolant evaporates to pressurized steam. The transfer of heat is accomplished without mixing the two fluids to prevent the secondary coolant from becoming radioactive. Some common steam generator arrangements are u-tubes or single pass heat exchangers. In a nuclear power station, the pressurized steam is fed through a steam turbine which drives an electrical generator connected to the electric grid for transmission. After passing through the turbine the secondary coolant (water-steam mixture) is cooled down and condensed in a condenser. The condenser converts the steam to a liquid so that it can be pumped back into the steam generator, and maintains a vacuum at the turbine outlet so that the pressure drop across the turbine, and hence the energy extracted from the steam, is maximized. Before being fed into the steam generator, the condensed steam (referred to as feedwater) is sometimes preheated in order to minimize thermal shock. The steam generated has other uses besides power generation. In nuclear ships and submarines, the steam is fed through a steam turbine connected to a set of speed reduction gears to a shaft used for propulsion. Direct mechanical action by expansion of the steam can be used for a steam-powered aircraft catapult or similar applications. District heating by the steam is used in some countries and direct heating is applied to internal plant applications. Two things are characteristic for the pressurized water reactor (PWR) when compared with other reactor types: coolant loop separation from the steam system and pressure inside the primary coolant loop. In a PWR, there are two separate coolant loops (primary and secondary), which are both filled with demineralized/deionized water. A boiling water reactor, by contrast, has only one coolant loop, while more exotic designs such as breeder reactors use substances other than water for coolant and moderator (e.g. sodium in its liquid state as coolant or graphite as a moderator). The pressure in the primary coolant loop is typically 15–16 megapascals (150–160 bar), which is notably higher than in other nuclear reactors, and nearly twice that of a boiling water reactor (BWR). As an effect of this, only localized boiling occurs and steam will recondense promptly in the bulk fluid. By contrast, in a boiling water reactor the primary coolant is designed to boil. Light water is used as the primary coolant in a PWR. Water enters through the bottom of the reactor's core at about 548 K (275 °C; 527 °F) and is heated as it flows upwards through the reactor core to a temperature of about 588 K (315 °C; 599 °F). The water remains liquid despite the high temperature due to the high pressure in the primary coolant loop, usually around 155 bar (15.5 MPa 153 atm, 2,250 psi). In water, the critical point occurs at around 647 K (374 °C; 705 °F) and 22.064 MPa (3200 psi or 218 atm). Pressure in the primary circuit is maintained by a pressurizer, a separate vessel that is connected to the primary circuit and partially filled with water which is heated to the saturation temperature (boiling point) for the desired pressure by submerged electrical heaters. To achieve a pressure of 155 bars (15.5 MPa), the pressurizer temperature is maintained at 345 °C (653 °F), which gives a subcooling margin (the difference between the pressurizer temperature and the highest temperature in the reactor core) of 30 °C (54 °F). As 345 °C is the boiling point of water at 155 bar, the liquid water is at the edge of a phase change. Thermal transients in the reactor coolant system result in large swings in pressurizer liquid/steam volume, and total pressurizer volume is designed around absorbing these transients without uncovering the heaters or emptying the pressurizer. Pressure transients in the primary coolant system manifest as temperature transients in the pressurizer and are controlled through the use of automatic heaters and water spray, which raise and lower pressurizer temperature, respectively. The coolant is pumped around the primary circuit by powerful pumps. After picking up heat as it passes through the reactor core, the primary coolant transfers heat in a steam generator to water in a lower pressure secondary circuit, evaporating the secondary coolant to saturated steam — in most designs 6.2 MPa (60 atm, 900 psia), 275 °C (530 °F) — for use in the steam turbine. The cooled primary coolant is then returned to the reactor vessel to be heated again. Pressurized water reactors, like all thermal reactor designs, require the fast fission neutrons to be slowed down (a process called moderation or thermal) in order to interact with the nuclear fuel and sustain the chain reaction. In PWRs the coolant water is used as a moderator by letting the neutrons undergo multiple collisions with light hydrogen atoms in the water, losing speed in the process. This "moderating" of neutrons will happen more often when the water is more dense (more collisions will occur). The use of water as a moderator is an important safety feature of PWRs, as an increase in temperature may cause the water to expand, giving greater 'gaps' between the water molecules and reducing the probability of thermalisation—thereby reducing the extent to which neutrons are slowed down and hence reducing the reactivity in the reactor. Therefore, if reactivity increases beyond normal, the reduced moderation of neutrons will cause the chain reaction to slow down, producing less heat. This property, known as the negative temperature coefficient of reactivity, makes PWR reactors very stable. This process is referred to as 'Self-Regulating', i.e. the hotter the coolant becomes, the less reactive the plant becomes, shutting itself down slightly to compensate and vice versa. Thus the plant controls itself around a given temperature set by the position of the control rods. In contrast, the RBMK reactor design used at Chernobyl, which uses graphite instead of water as the moderator and uses boiling water as the coolant, has a large positive thermal coefficient of reactivity, that increases heat generation when coolant water temperatures increase. This makes the RBMK design less stable than pressurized water reactors. In addition to its property of slowing down neutrons when serving as a moderator, water also has a property of absorbing neutrons, albeit to a lesser degree. When the coolant water temperature increases, the boiling increases, which creates voids. Thus there is less water to absorb thermal neutrons that have already been slowed down by the graphite moderator, causing an increase in reactivity. This property is called the void coefficient of reactivity, and in an RBMK reactor like Chernobyl, the void coefficient is positive, and fairly large, causing rapid transients. This design characteristic of the RBMK reactor is generally seen as one of several causes of the Chernobyl disaster. Heavy water has very low neutron absorption, so heavy water reactors tend to have a positive void coefficient, though the CANDU reactor design mitigates this issue by using unenriched, natural uranium; these reactors are also designed with a number of passive safety systems not found in the original RBMK design. PWRs are designed to be maintained in an undermoderated state, meaning that there is room for increased water volume or density to further increase moderation, because if moderation were near saturation, then a reduction in density of the moderator/coolant could reduce neutron absorption significantly while reducing moderation only slightly, making the void coefficient positive. Also, light water is actually a somewhat stronger moderator of neutrons than heavy water, though heavy water's neutron absorption is much lower. Because of these two facts, light water reactors have a relatively small moderator volume and therefore have compact cores. One next generation design, the supercritical water reactor, is even less moderated. A less moderated neutron energy spectrum does worsen the capture/fission ratio for 235U and especially 239Pu, meaning that more fissile nuclei fail to fission on neutron absorption and instead capture the neutron to become a heavier nonfissile isotope, wasting one or more neutrons and increasing accumulation of heavy transuranic actinides, some of which have long half-lives. PWR fuel bundle This fuel bundle is from a pressurized water reactor of the nuclear passenger and cargo ship NS Savannah. Designed and built by Babcock & Wilcox. 2) powder is fired in a high-temperature, sintering furnace to create hard, ceramic pellets of enriched uranium dioxide. The cylindrical pellets are then clad in a corrosion-resistant zirconium metal alloy Zircaloy which are backfilled with helium to aid heat conduction and detect leakages. Zircaloy is chosen because of its mechanical properties and its low absorption cross section. The finished fuel rods are grouped in fuel assemblies, called fuel bundles, that are then used to build the core of the reactor. A typical PWR has fuel assemblies of 200 to 300 rods each, and a large reactor would have about 150–250 such assemblies with 80–100 tonnes of uranium in all. Generally, the fuel bundles consist of fuel rods bundled 14 × 14 to 17 × 17. A PWR produces on the order of 900 to 1,600 MWe. PWR fuel bundles are about 4 meters in length. Refuelings for most commercial PWRs is on an 18–24 month cycle. Approximately one third of the core is replaced each refueling, though some more modern refueling schemes may reduce refuel time to a few days and allow refueling to occur on a shorter periodicity. In PWRs reactor power can be viewed as following steam (turbine) demand due to the reactivity feedback of the temperature change caused by increased or decreased steam flow. (See: Negative temperature coefficient.) Boron and control rods are used to maintain primary system temperature at the desired point. In order to decrease power, the operator throttles shut turbine inlet valves. This would result in less steam being drawn from the steam generators. This results in the primary loop increasing in temperature. The higher temperature causes the density of the primary reactor coolant water to decrease, allowing higher neutron speeds, thus less fission and decreased power output. This decrease of power will eventually result in primary system temperature returning to its previous steady-state value. The operator can control the steady state operating temperature by addition of boric acid and/or movement of control rods. The control rods can also be used to compensate for nuclear poison inventory and to compensate for nuclear fuel depletion. However, these effects are more usually accommodated by altering the primary coolant boric acid concentration. In contrast, BWRs have no boron in the reactor coolant and control the reactor power by adjusting the reactor coolant flow rate. PWR reactors are very stable due to their tendency to produce less power as temperatures increase; this makes the reactor easier to operate from a stability standpoint. PWR turbine cycle loop is separate from the primary loop, so the water in the secondary loop is not contaminated by radioactive materials. PWRs can passively scram the reactor in the event that offsite power is lost to immediately stop the primary nuclear reaction. The control rods are held by electromagnets and fall by gravity when current is lost; full insertion safely shuts down the primary nuclear reaction. PWR technology is favoured by nations seeking to develop a nuclear navy; the compact reactors fit well in nuclear submarines and other nuclear ships. The coolant water must be highly pressurized to remain liquid at high temperatures. This requires high strength piping and a heavy pressure vessel and hence increases construction costs. The higher pressure can increase the consequences of a loss-of-coolant accident. The reactor pressure vessel is manufactured from ductile steel but, as the plant is operated, neutron flux from the reactor causes this steel to become less ductile. Eventually the ductility of the steel will reach limits determined by the applicable boiler and pressure vessel standards, and the pressure vessel must be repaired or replaced. This might not be practical or economic, and so determines the life of the plant. Additional high pressure components such as reactor coolant pumps, pressurizer, steam generators, etc. are also needed. This also increases the capital cost and complexity of a PWR power plant. The high temperature water coolant with boric acid dissolved in it is corrosive to carbon steel (but not stainless steel); this can cause radioactive corrosion products to circulate in the primary coolant loop. This not only limits the lifetime of the reactor, but the systems that filter out the corrosion products and adjust the boric acid concentration add significantly to the overall cost of the reactor and to radiation exposure. In one instance, this has resulted in severe corrosion to control rod drive mechanisms when the boric acid solution leaked through the seal between the mechanism itself and the primary system. Natural uranium is only 0.7% uranium-235, the isotope necessary for thermal reactors. This makes it necessary to enrich the uranium fuel, which significantly increases the costs of fuel production. Because water acts as a neutron moderator, it is not possible to build a fast neutron reactor with a PWR design. A reduced moderation water reactor may however achieve a breeding ratio greater than unity, though this reactor design has disadvantages of its own. ^ "Rickover: Setting the Nuclear Navy's Course". ORNL Review. Oak Ridge National Laboratory, U.S. Dept. of Energy. Archived from the original on 2007-10-21. Retrieved 2008-05-21. ^ Rockwell, Theodore (1992). The Rickover Effect. Naval Institute Press. p. 162. ISBN 978-1557507020. ^ "50 Years of Nuclear Energy" (PDF). IAEA. Retrieved 2008-12-29. ^ International Association for the Properties of Water and Steam, 2007. ^ Forty, C.B.A. ; P.J. Karditsas. "Uses of Zirconium Alloys in Fusion Applications" (PDF). EURATOM/UKAEA Fusion Association, Culham Science Centre. Archived from the original (PDF) on February 25, 2009. Retrieved 2008-05-21. ^ "Davis-Besse: The Reactor with a Hole in its Head" (PDF). UCS -- Aging Nuclear Plants. Union of Concerned Scientists. Retrieved 2008-07-01. ^ Wald, Matthew (May 1, 2003). "Extraordinary Reactor Leak Gets the Industry's Attention". New York Times. Retrieved 2009-09-10. Duderstadt, James J.; Hamilton, Louis J. (1976). Nuclear Reactor Analysis. Wiley. ISBN 978-0471223634. Glasstone, Samuel; Sesonkse, Alexander (1994). Nuclear Reactor Engineering. Chapman and Hall. ISBN 978-0412985218. Mosey, David (1990). Reactor Accidents. Nuclear Engineering International Special Publications. pp. 92–94. ISBN 978-0408061988. Tong, L.S. (1988). 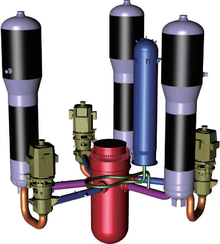 Principles of Design Improvement for Light Water Reactors. Hemisphere. ISBN 978-0891164166. Wikimedia Commons has media related to Pressurized water reactors. Nuclear Science and Engineering at MIT OpenCourseWare. Document archives at the website of the United States Nuclear Regulatory Commission. Operating Principles of a Pressurized Water Reactor (YouTube video). Fuel Consumption of a Pressurized Water Reactor. This page was last edited on 3 April 2019, at 10:13 (UTC).